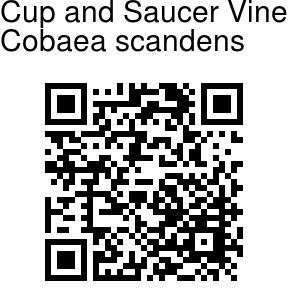 Cup and Saucer Vine is a vigorous and showy vine, native of tropical America, where it grows as a strong woody perennial. The buds start out green and open to reveal the green saucer and bell shaped flowers. The large, pale green flowers become striped with violet, finally changing to deep purple, all on the vine at the same time. Flowers last about 4 days, and have a musky fragrance. 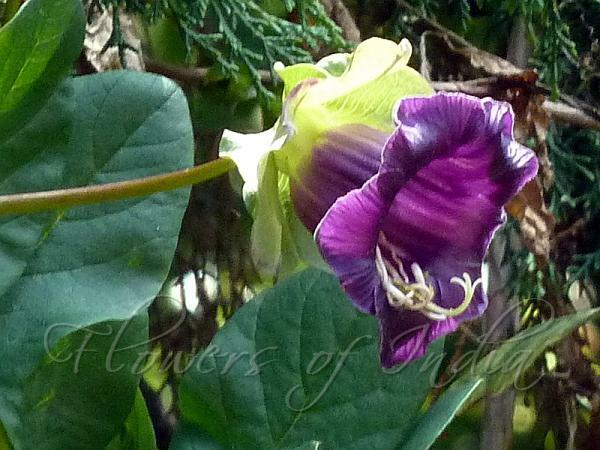 This is complemented by violet shaded tendrils and leaves that grows up to 8 cm. The leaves are 4 inches long, composed of four leaflets and a tendril with many little hooks on it, which it uses to climb. Charles Darwin was so impressed he studied Cobaea for his book The Movements and Habits of Climbing Plants (1875). Flowers are reportedly pollinated by bats.